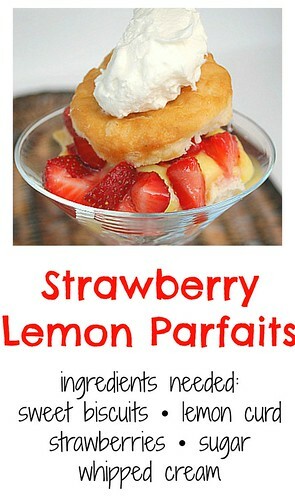 Strawberries and lemons make a delicious and refreshing combination in drinks and desserts. I used fresh strawberries which I macerated and made a homemade lemon curd. These were layered with crumbled sweet biscuits in a simple martini glass and topped with whipped cream. 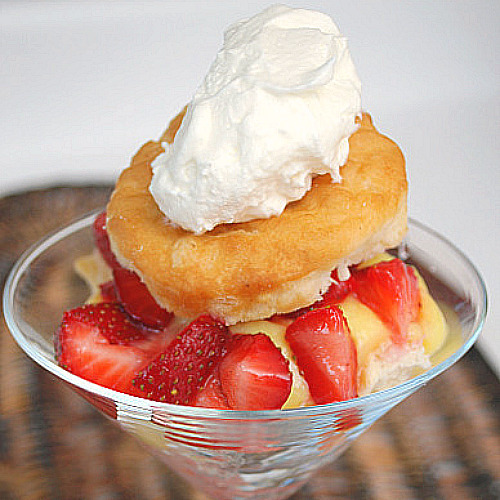 It's an easy, yet elegant dessert where you can use any fresh fruit and custard of your choice! In a small bowl, roughly chop up the strawberries and toss with the sugar; set aside. In a martini glass or your preferred serving dish, crumble the bottom halves of the biscuits, distributed evenly. Place a heaping tablespoon (or two) of lemon curd over the crumbled biscuit in each glass. Top the lemon curd with a heaping tablespoon (or two) of strawberries in each glass. Place the sweet cream biscuit tops over the lemon curd and dollop with whipped cream for garnish. Getting ready: Center a rack in the oven and preheat the oven to 425 degrees F. Get out a sharp 2-inch-diameter biscuit cutter (I used a glass, and it was fine), and line a baking sheet with parchment or a silicone mat. Whisk the flour(s), baking powder, sugar and salt together in a bowl. Pour about 1 cup of the cream over the dry ingredients, grab a fork and start tossing the ingredients together. If necessary, add more cream, a spoonful at a time, until you’ve got a nice soft dough. Now reach into the bowl with your hands and give the dough a quick, gentle kneading – 3 or 4 turns should be just enough to bring everything together. Lightly dust a work surface with flour and turn out the dough. Dust the top of the dough very lightly with flour and pat the dough out with your hands or roll it with a pin until it is about 1/2 inch high. Don’t worry if the dough isn’t completely even – a quick, light touch is more important than accuracy. 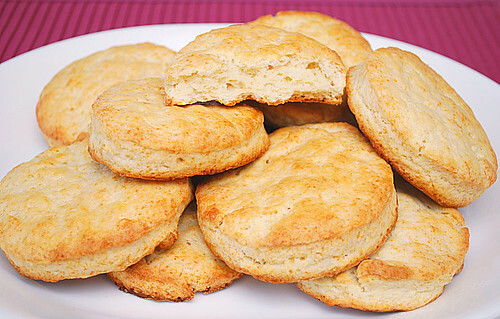 Bake the biscuits for 14 to 18 minutes, or until they are tall, puffed and golden brown. Transfer them to a serving basket. Serving: Ideally these biscuits should go from oven to table and be served with cold sweet butter. Those biscuits look beautiful!! What a great dessert! This is so interesting. I like to make something like this. It really looks so refreshing. If I got this dessert at a dinner party, I'd be all over it and over the moon. So refreshing! I'll have to try it at a dinner party next summer.